From the moment your child is born, one of the first things the maternity nurse teaches you is how to perfectly swaddle your little one. However, it seemed like the moment Amari and I had gotten home, he was no longer a fan, no matter how perfect I thought I had made my “burrito”. 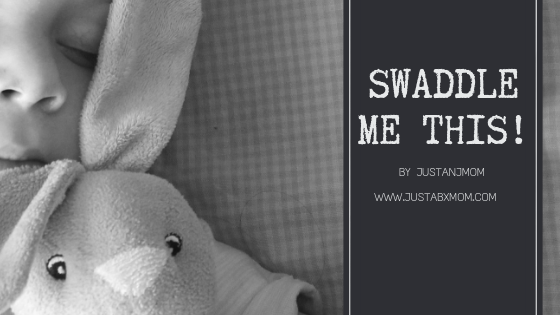 There seemed to be this connection between baby swaddle and slumber… the firmer the wrap, the longer the baby slept. But it just seemed like after a few kicks and punches, his digs would come undone and so would my good night’s sleep. I had become frustrated because I couldn’t understand how just 2 weeks ago he loved being this bundle of joy. Could he have just that quickly decided that he would Houdini out every time just to avoid falling asleep? I started to think that the kicked off threads were keeping him up the same way I can’t fall asleep when my comforter and sheets are bunched up at my feet. And so began my quest for the perfect sleep sack. After going through quite a few of them (I couldn’t believe there were actually so many out there) I narrowed the list down to these three favorites. Nested Bean 2-in-1 Zen Swaddle – This is one really cool looking swaddle. The nice feature about it is the weighted beans on the front and the sides of the swaddle. They are supposed to mimic the weight of the parent’s hand on the babies chest tricking them into falling asleep. The material is also very soft and comfortable. The velcro that Nested Bean used miraculously doesn’t stick to everything in the wash so you don’t have to worry about clothes getting destroyed. I also like how this swaddle grows with the baby. There are 2 separate pouches to “insert” your baby. There is a smaller inside pouch for when your baby is under 10 pounds to hold them more snuggly and the outer pouch for when they get a little larger. One drawback is that because of the design, I had to remove the entire bag for the middle of the night diaper changes which would fully wake Amari into thinking it’s playtime. And once again, when my guy got a little bigger, he was able to break free of these wraps as well. Nested Bean also designed their sacks to be used with the arms out, which allowed this one to be useful for a little longer. Nested Bean is a bit on the expensive side so it will run you about $32 bucks but if you are anything like me, its worth the good night’s sleep. Love To Dream Swaddle Up – As much as Amari takes pride in breaking free of his preverbal sleep chains, once his arms are out, his startle reflexes keep him from actually snoozing. I had to find a sleep sack that he couldn’t wiggle his way out of. This one was my absolute favorite of them all. If you notice, when you lay your baby on their back, their automatic sleep position is arms up. This swaddle is designed to let your baby sleep in this natural state… LONGER. There has never been a time that I have placed Amari in this sac that he wasn’t asleep within 15 minutes. When my kid does finally wake up, because he can reach his hand and cheek, he can naturally soothe himself back to sleep. The material is super soft and stretchy and ergonomically designed with a womb-like fit which helps control that startle reflex (goodness did that use to keep us up a night). I also love that Swaddle Up opted for a dual zipper instead of the Velcro so diaper changes are a breeze and Amari can’t McGuyver himself out of this one! These sacks cost about $28 bucks and in my opinion, worth every cent.